We had done whitewater rafting, zip lining, mountain biking and a whole lot of hiking — but there was still one more outdoor activity we wanted to try: horseback riding. 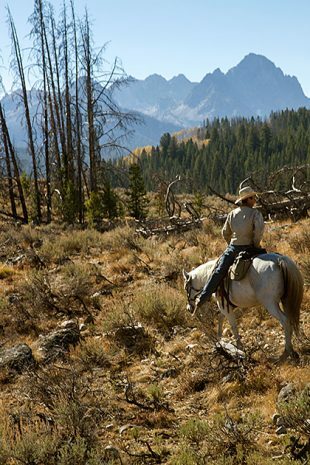 And we couldn’t have chosen a better place to knock it off our list than in the Sawtooth Mountains around Redfish Lake. 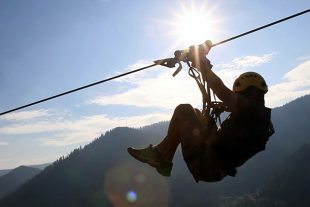 Not much is required for a good Zip Line course. A few high-altitude hills or trees. Some poles stuck into the ground. Wire. Harnesses and helmets. That’s about it. Nice views are a plus, but optional. After all, when you’re flying through the air at 45mph, looking around isn’t a priority. But the mountain vistas on display during our run through Silver Streak’s course were too beautiful to completely ignore. Most of my zips went like this: terror (“WAGHHHHHHH!”), admiring nature’s beauty (“AHHHHHHHH!”), and back to terror (“AAYYYYGGGHGHGHHG!”).